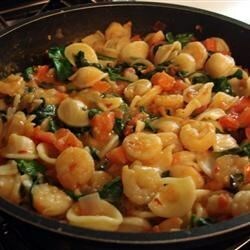 "This wonderful spicy shrimp and pasta dish is delicious, easy and elegant. Very spicy - add Cajun seasoning to suit your tastes." Bring a large pot of lightly salted water to a boil. Add orecchiette pasta, and cook for 9 to 11 minutes, until almost al dente; drain. Melt butter in a medium skillet over medium heat. Stir in shallots, garlic, and green onion. Season with Cajun seasoning and pepper, and cook about 2 minutes. Mix in wine, tomatoes, and shrimp. Continue to cook and stir until shrimp are opaque. Mix in the pasta and spinach, cover, and simmer 3 to 5 minutes, until pasta is al dente and spinach has wilted.